As we discussed last week, encouraging customer reviews is a key component in getting your small business found on Google and other search engines. So if reviews affect your small business’ search placement so much, what are the very best sites to encourage reviews from? What sites are picked up by Google’s Local Business Center most frequently? 1) www.citysearch.com – Citysearch was the runaway winner when it came to restaurant reviews, accounting for 1,594 of the 3,398 reviews studied. Taking credit for nearly half of the restaurant reviews in Google’s Local Business center is a truly impressive feat. Feel confident encouraging your customers to review at Citysearch, they are a proven commodity. 2) www.tripadvisor.com – Coming in second was the travel-specific website: TripAdvisor.com, which allows users to rate and review hotels, restaurants and other travel related destinations. TripAdvisor clearly has a strong passive feed with Google, accounting for 472 of the 3,398 reviews studied. If your restaurant is located in a large travel hub or destination, feel comfortable encouraging customers to review on this site. However, restaurants in small towns should explore better options, as TripAdvisor doesn’t pay too much attention to the little guy. (For example, TripAdvisor doesn’t show a single restaurant in my hometown of Eureka, IL – though we have several, just ask Citysearch). 3) www.zagat.com – Coming in third with 207 total reviews is another industry specific website: Zagat.com, which also specializes in hotel, restaurant and travel specific reviews. When it comes to encouraging customer reviews the playbook for Zagat is identical to TripAdvisor. The site clearly has a strong passive feed with Google and you should feel comfortable pointing customers in Zagat’s direction if your restaurant is in a major city or travel hub. 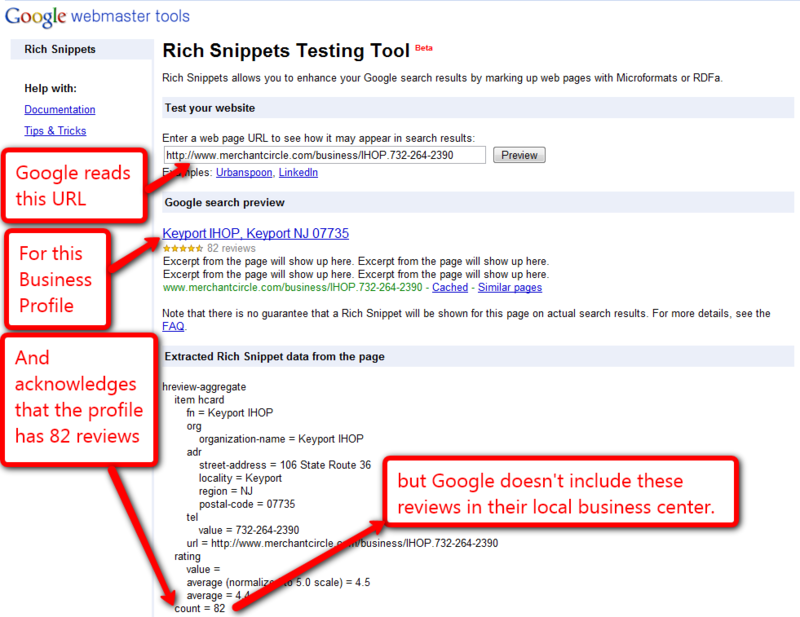 4) maps.google.com – To the surprise of no one, Google makes the list, coming in at number four with 198 total reviews. The advice here is a slam dunk: Feel 100% comfortable pointing potential reviewers to Google. Unlike the other sites we have noted, Google doesn’t need to crawl anything to find these reviews, they are dropped off right on Google’s doorstep, showing up in the Local Business Center almost immediately. To write a review on Google, simply search the business you wish to review, click through to their profile and scroll down until you see “Write a Review” (as seen below). 5) www.urbanspoon.com – Rounding out the top 5 is one final industry-specific review site, Urbanspoon.com, which focuses entirely on the restaurant information industry. Though Urbanspoon only pulled down 162 of the 3,398 reviews studied, they are still comfortably situated on Google’s radar. Try encouraging your younger clientele to review your restaurant on Urbanspoon. Their site is very iPhone-friendly, you may be able to score a review right on the spot. 1) Yelp.com – In the review game, Yelp is an absolute powerhouse. Our own study of the sites feeding into Google covered 30 restaurants in 10 cities, ultimately totaling 3,398 reviews. Just for fun, we checked to see how many reviews these 30 restaurants had in Yelp. 4,382. That’s not a typo. Yelp exceeded Google’s aggregated review count by nearly 1,000. So why aren’t Yelp reviews picked up by the Google Local Business Center? Here’s the short version: Yelp reviews used to be picked up by Google. Google tried to buy Yelp for $550 million. Yelp declined. Now Yelp reviews are not picked up by Google. 3) EZlocal.com – Okay, maybe we aren’t notable yet, but we are enthusiastic about local search, and especially passionate about how it relates to small business owners. Good things are happening here at EZlocal, stay tuned. · We chose the top ten cities in the U.S. by population, but omitted any city that was already represented by another in the same state. (e.g. We omitted San Antonio and Dallas because Texas was already represented by Houston). · We selected the three restaurants on the first page of search results with the most reviews. · We went through these reviews for each of the 30 selected restaurants in the 10 selected cities and noted what site they were drawn from. · We collected data on 3,398 reviews, which is our sample size for this article.